Music Project at FAST, Romania. For some of our projects, it would be really great to have donations of items. For example, we are linked with the Shanghai Bo Ai Children’s Rehabilitation Centre in Shanghai, which needs equipment that is not easily available in China. 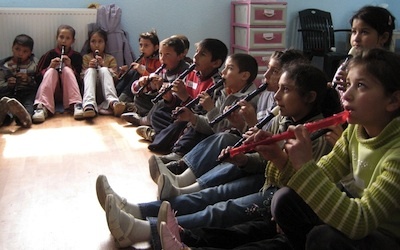 In Romania, one of the organisations, FAST, runs a music project, and it would be great to have donations of children’s recorders, and other instruments. From time to time, we also arrange collections of clothes, toys, or school items for distribution to our projects. Whenever we are running a collection, it will be advertised here, so keep checking back! Shipping costs can be high, so we usually only run collections if a volunteer is going to a project, and can take the items there. Some of the local organisations we support would be happy to receive items if you are travelling to where they are based. If you are going to any of the countries we work in and would like to take donated items, please contact us, as it may be possible to set this up.